The three Westminster constituencies that meet the Border are currently held by each of the three unionist parties. In the middle is Dumfriesshire, Clydesdale and Tweeddale, currently held by David Mundell, Scotland’s sole Conservative MP. Over in the west, Dumfries and Galloway is currently in the possession of Labour’s Russell Brown. The Tories are pouring money into the area and their top target seat is the third Borderlands seat, Berwickshire, Roxburgh and Selkirk, currently held by Liberal Democrat, Michael Moore. The Conservative candidate is MSP, John Lamont who is standing in his third attempt at the Westminster seat. One thing John Lamont and SNP candidate, Calum Kerr, agree on is that this is a straight SNP/Tory contest following the collapse of the Liberal Democrat vote. Just as the Liberal Democrat vote all but evaporated with the SNP landslide in 2011, the polls are all pointing to a similar result in their Scottish Westminster seats this May. Polling analysts are comparing 2010 results with the current round of polls for May. Whilst this is understandable in a UK context, the situation in Scotland is a great deal more complex, and a great deal more interesting than the ‘surprise’ rebound of the SNP following the referendum, as reported south of the Border. In the early years of the Scottish Parliament, the Scottish electorate had worked out how best to vote to turf out the Tories. Differential voting patterns emerged for Westminster and the Scottish Parliament. The constituency and regional list votes for the Scottish Parliament gave voters another twist to work into their voting strategies. Much of the shift in the Labour vote across Scotland started in 2011. The Referendum was a means of consolidating that move behind the campaign for Independence. During this period the polls were also beginning to show a convergence of voting intentions for Westminster and Holyrood with the SNP ahead for both parliaments. The solid lead that the SNP has built up since the referendum is a continuum of this trend, recruiting those who trust the Scottish Parliament and want to see more real powers devolved, even if some were unsure about independence. This alignment in voting intentions for Holyrood and Westminster is therefore a natural progression to achieve the greatest influence for Scotland’s interest after May 7th. 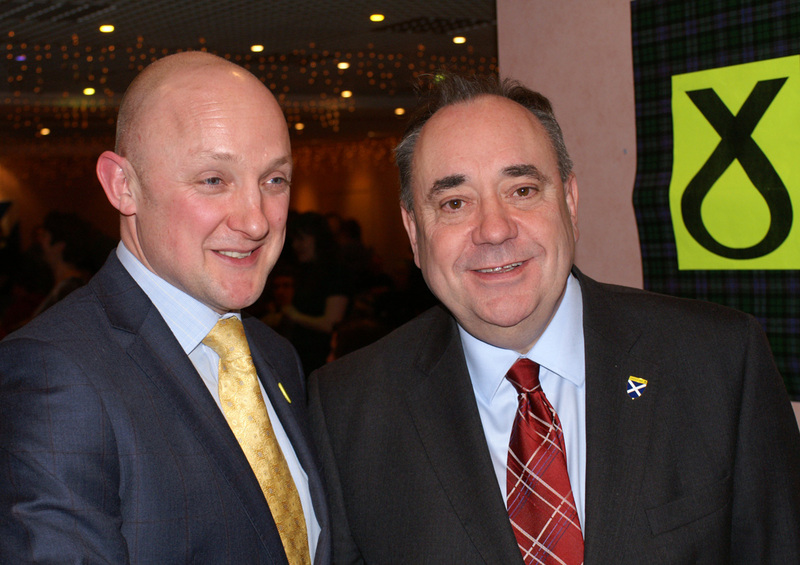 Calum Kerr, the SNPs candidate for Berwickshire, Roxburgh and Selkirk has reason to be confident he can win the seat. He is aware of the challenge posed by his Tory opponent, who is already flooding the constituency with weekly letters sent by post, and a constituency-wide postal distribution of his first 6 page leaflet. It takes more than money to win. You have to win the people over and Calum has a dedicated team behind him. According to a calculation by Wings Over Scotland, Ruth Davidson only had an audience of 100 people, including candidates and journalists, for her speech at the Conservative half-day conference in Edinburgh last week. That same evening, in the Cross Keys Hotel in Kelso, 240 members turned out for an amazing adoption meeting for Berwickshire, Roxburgh and Selkirk, SNP candidate, Calum Kerr. Over the years I have attended a few adoption meetings, but never one so well organised, entertaining and impressive as this one. 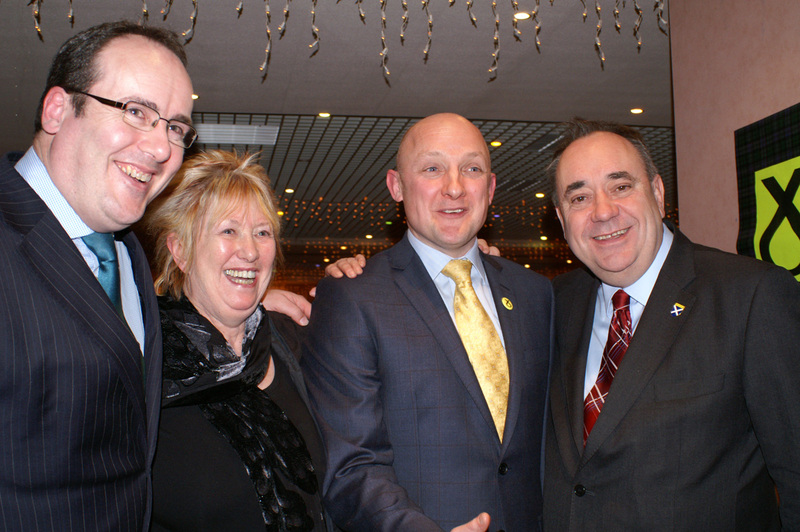 Follow up act to Calum was the irrepressible Alex Salmond. Despite being up since 5.30 on Friday morning, putting the finishing touches to his forthcoming… don’t think I am supposed to mention that… Alex had the audience enthralled, and MSP Christine Grahame in stitches as he shared with the audience his reason for backing Christine for Presiding Officer in 2011. Alex Salmond knows just how important this win in the Borders will be. On election night, commentators will be expecting wins in Dundee, Glasgow and the West of Scotland. Always one to champion the unexpected, Salmond said a win in Berwickshire, Roxburgh and Selkirk would underline that Scotland was sending a strong message south and reclaiming the Borderlands from unionist occupation and Tory ambitions. It helps also that the constituency has a Salmond family connection in the person of Gail Hendry, Alex’s sister, and by no coincidence, Calum’s election agent. In the Salmond tradition she likes to win and plans accordingly. Alex Salmond is taking the importance of the Borderland constituencies very seriously and will be back this week for a Burns celebration event in Dumfries to help fund the campaigns in the other two Borderlands constituencies. Emma Harper is standing against David Mundell in Dumfriesshire, Clydesdale and Tweeddale and Richard Arkless is taking on Labour’s Russell Brown in Dumfries and Galloway. Statistically Berwickshire, Roxburgh and Selkirk is the most winnable of the 3 Borderland constituencies. Electoral Calculus predicts, based on recent Scottish polling, an SNP gain with 57% probability, against 31% probability for the Tory and 11% probability for Michael Moore. In 2011 the SNP won on the regional list vote in the constituency as a result of a broad consensus that the SNP had been a competent and popular government in their first term in office. With the LibDem vote in free-fall and the anti Tory vote seeking a new home, Calum’s challenge is to persuade voters of the necessity to back a popular and trusted government in Holyrood to take the demand for more powers right to the heart of Westminster. For 50 years Borderers campaigned for the reopening of the Waverley line, but it took an SNP government to deliver it. I mean no disrespect to those who doggedly campaigned for so long, but the ability to deliver only comes with the power of government, and by not putting the ambitious of an important part of Scotland forever on the back burner. Calum’s campaign will be well organised. Teams will be out on the ground backed by decent financial resources, though without the deluge of money pouring into the Tory campaign. The Borders are an important and valued part of Scotland. To help ensure the yellow in the post-election map stretches from John O’Groats to the boundary with the old Scottish lands of Berwick-on-Tweed, Calum would welcome small contributions to his election appeal. 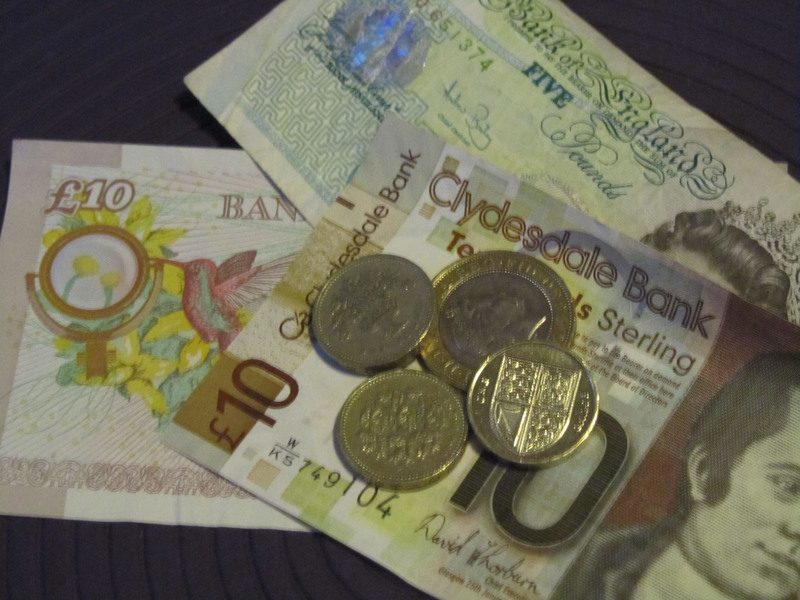 People in other parts of Scotland have their own campaigns to fund, so this appeal is for many small donations of £2 or £3 to show solidarity, and contain Conservative representation south of our Border. This entry was posted in Devo Max, Politics and tagged Alex Salmond, Calum Kerr, Christine Grahame, Holyrood, More powers, Paul Wheelhouse, Scotland, Westminster. Bookmark the permalink. The SNP should run candidates in the north of England border constituencies. Their proposition could be that a successful Scotland would benefit them more than centralised London rule. interesting proposal Brian! It would give the north an alternative to Lab, Con, Libdem and UKIP, with an anti-austerity option. The arguments are there to be made, given credible and able candidates. It would certainly stir the hornets nest, would be fun to watch!